Life is all about questions and answers. When in our journey, we don't seem to find an answer, we invoke the almighty and put the question to him, see if he can give us the answer, or better yet, help us to find the answers within ourselves. That is a part of spirituality that I admire. 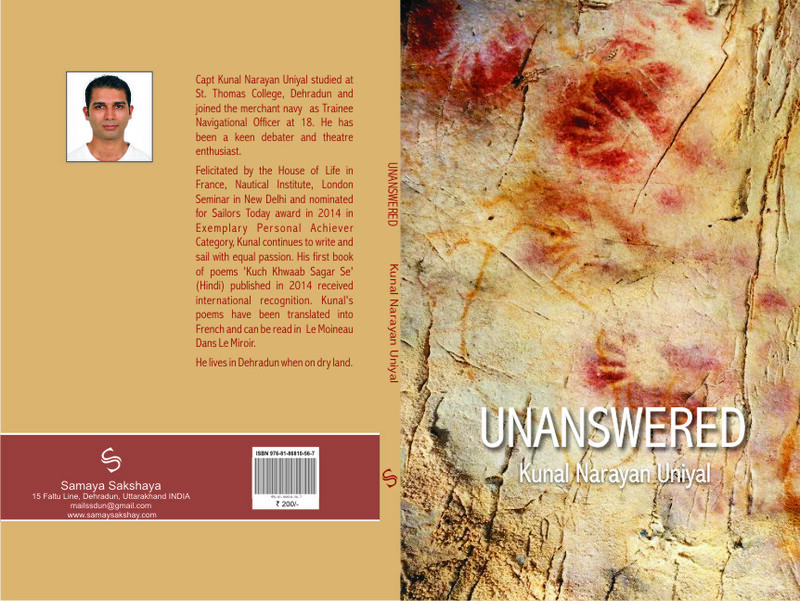 And to me, that's partly the path that this book "Unanswered" takes. The book is the poet's contemplation on life, and these questions, and at times, the answers that he finds to these questions. How one looks at different aspects or characteristics of life varies with each person. Through this book of poetry and philosophy, the poet looks at and discusses on topics like death, immortality, morality, dharma, ego etc. He seeks answers for these in the pages of spiritual and religious texts like the Bhagwad Gita, and enlightens us on what they say about these. And in his own style, he makes us think on those topics as well. Something that I noted down in particular was a quote from Bertrand Russell that I hadn't come across before: "It is the preoccupation with possessions, more than anything else that prevents us from living freely and nobly." I don't quite feel the poet or Russell talks of the very human yearning for something, but it's an obsession that we seem to have for something materialistic that kills peace. And another aspect of this book I could relate to was the contemplation on prayers, for they are something that's very common to mankind, not just a religion. Poetry cannot really be reviewed, I feel. One can only review or state what one finds or understands in the poem. It is an interpretation of the reader. If it matches the intent of the poet, the joy is more. If not, it doesn't mean that the poet or the reader has failed. The poet here shares many of his verses, but perhaps the one that stands out to me is the very first. What I can relate to is what will be memorable, after all. The poem, titled "You and I" questions and seeks the almighty, and queries if we, or the poet, can see Him in his form, that if He is everywhere and in everything, can He, for some moments, be ours and only ours. I've felt that often. More so, it reminded me of Hiranyakashipu, who wanted to see if God was in a pillar, though not with the same emotions. There is depth, I accept, in this collection of Capt. Uniyal's thoughts. And it is warranted. But it might still be a bit heavy for most readers, with the vocabulary especially not helping to keep my attention on the prose. But it is worth diving into, and it is appreciable. I like the book for the most part, but it doesn't engage me a lot. So I rate it 3.5 stars. Best wishes to the author for his future books. Reviewed by Vinay Leo R. for the author, who gave a copy of the eBook. Books that talk on life are interesting, and there are many that help inspire us to look at life in a different way too. I came to know of this book from a friend, and the way she put it across, it felt very interesting. So I took it up to read. 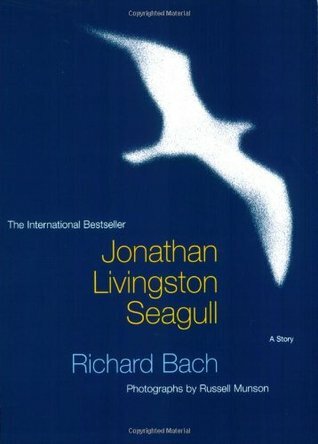 Jonathan Livingston Seagull is one who stands out from the colony of seagulls and their usual way, their habits. He's not welcomed when he does that, or when he questions the norms, and is eventually thrown out of the colony. But that doesn't break his willpower or change his attitude. He continues to aspire, taking the hardships that come in his stride. He continues to challenge the boundaries that the gulls have been taught to keep within. Eventually, he returns to near the flock, and finds more and more gulls willing to break the boundaries, and learn from what he has to share. What I loved in the book is that teaching, that we don't have to be part of the crowd, that it is okay to question, that we shouldn't be dejected when we are chastised for that and continue to aspire. There are beautiful photos as well to add to the story. However, I felt the book, as it progressed, became more preachy than teachy. And that kind of doused the interest a little. An interesting book which I'll look at when a little inspiration is needed. I rate it 3 stars. Roomies cookbook is not just for desi folks in foreign lands but it is a bloody good book ( smart name publishers !) for any one who has not cooked much and is going to stay alone. Eating out is never a long term option not to mention the adverse effect on health. Today guys and gals have to know some bit cooking for survival away from home. In that context too, i felt this book is self sufficient. The authors have not left any thing out of the book. So generous have these ladies been while sharing not just recipes but also substitutes , the ways to pair up the dishes and even how to store them and for how long. The appendix has the ways to prepare basic essentials , the various cooking terms , the common ingredients and even what to carry from india and what is better bought from the place you settle in. This is one of the best book to gift to anyone gong away from mother's or wife's kitchens. Specially to get accustomed with the appendix well in advance so you can soon begin cooking your meals. The recipes are easy to follow ( even if you do not use your head much ) , gives you scope to experiment / change as per your taste and very much manageable alone too. This is no fuss , hearty , homely cooking. The stories behind each recipe makes you smile and bond better too. I do not have any pic yet to share but I tried 2 of the dishes already and am much happy with the results. More cooking shall happen soon. Murder in the orient express is a unique book coz the whole book is set in a span of about 2-3 days. Also, the events happen and are solved on the train without any external help. The writing is slow but that helps in building the layers of the story and to give all facts to the reader. At no point, is the reader not aware of what is happenning or the questions Poirot asks. It is upto you to keep a track of all the clues and conversations to make the connections. This book in particular completely took me on a wonderful ride. Such charm, such delightful characters and such vintage feel to the whole scene. I am in love with Agatha Christie and Poirot. Hopefully this year I can finish all Poirot books. From the last 4 years , I have been reading "Tuesdays with Morrie" in the first week of Jan. And being someone too used to rituals, I never tried another book or author. 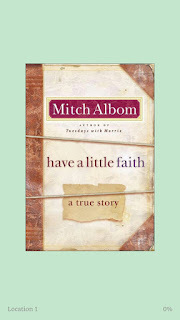 This year God had other plans so I happened to come across this book "have a little faith" by same author. This is a true story of Mitch's Rabi and their conversations in differed settings over a period of 8 years. 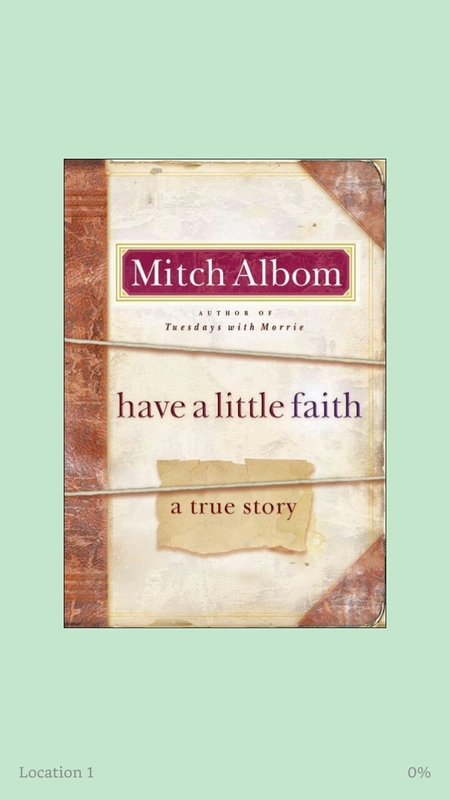 In those eight years, Mitch gets a chance to rediscover faith , his roots and also some of the human emotions he had lost touch with. The book also has the story of Henry , a convict turned into Christian pastor. And for me that story was some how more inspiring. The book no where wants you to believe in God but more than that it makes you aware of the ways we have tied our self to meaningless pursuits and how our joys are always linked to what and how much we give back to others. It is a lot of stuff you already know but put in context of real people - people who are flawed yet the goodness survives even today. Faith is about doing. It is how you act , not what you believe. I personally liked this book though many sceptical readers might not enjoy it as much. Still this one I feel has something for all of us. Here's wishing you a glorious year in all you do and read. Bless you !